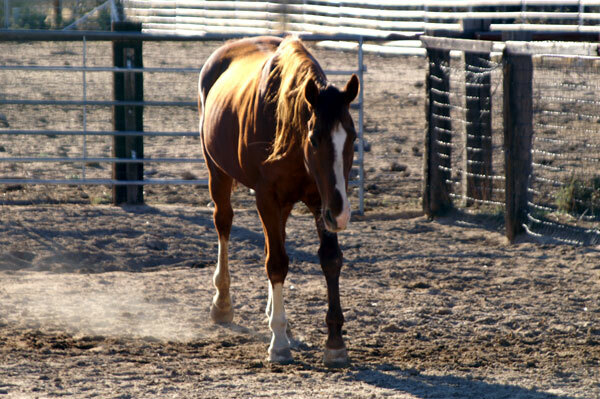 Thank you for helping us support these horses and giving them a chance to live out their lives on our 120 acre ranch. Some have been adopted while others have passed away. 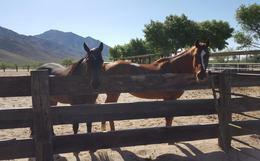 They will always be a part of our lives as they were once part of Equine Encore Foundation. 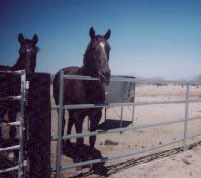 Champion Arizona Quarter Horse checking to see who's watching. He has passed away. This horse started 103 times. Unfortunately, his cribbing habit brought about his untimely death. 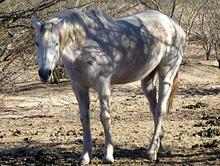 This mare was very fast but couldn't stay sound. She has passed away. 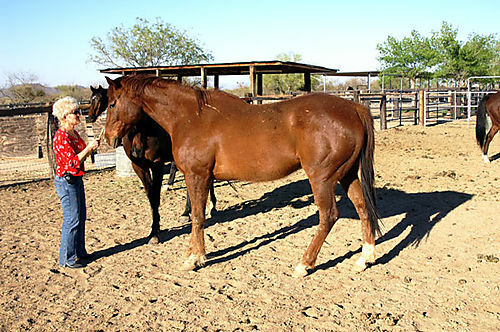 She was the first horse born on the farm when it still was a breeding facility. She has passed away. He raced most of his life in Arizona. He has passed away. 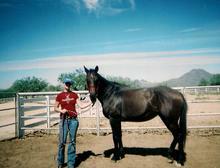 Champion Quarter Horse at 870 yards. 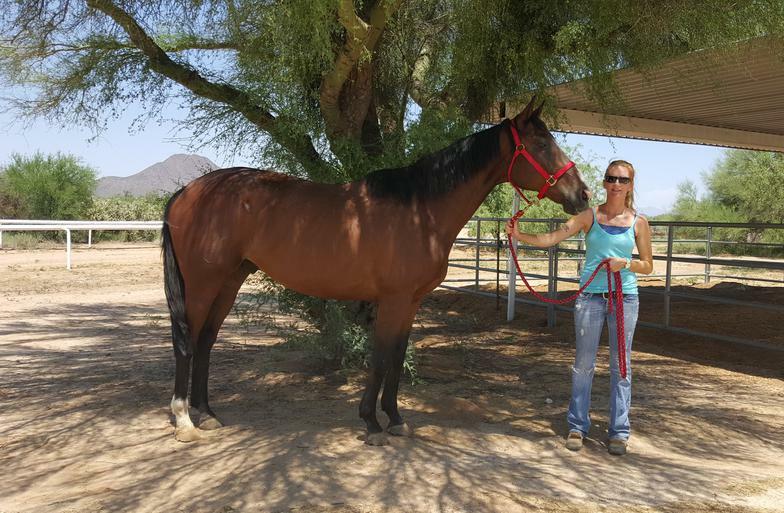 He was the first official Equine Encore Foundation resident and has been adopted. Great guy who has passed away too soon. This stakes winning horse had a short but brilliant career. He has been adopted. 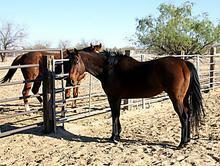 He came to us as a stallion from Santa Anita with a condylar fracture in his foreleg. He has been adopted. He is a bit of a loner and is happy when he is "horse watching". He has been adopted. His career ended with a bowed tendon in Farmington, NM. He has been adopted. 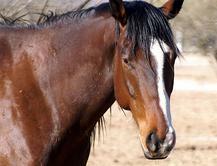 He was a talented Racehorse who was going places until he bowed a tendon. Unfortunately, he has passed away. She had shown talent in her brief career. She is a feisty little girl, who has been adopted. He only raced in his birth state of New Mexico and his career was cut short due to knee surgery. He has passed away. 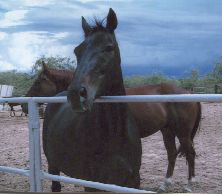 He raced his entire career in New Mexico and he was very successful. He earned more than $800,000. He has passed away. He was born a winner. He was in the winner's circle 13 times and set track records. He has passed away. 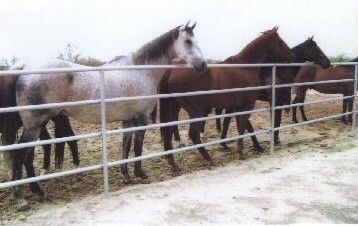 He ran second in the Grade 2 Arkansas Derby and competed in the Preakness Stakes in 1999. He has passed away. He was nothing like his name. In fact, we frequently called him “Afternoon Delites”. Unfortunately, injury cut his career short. He has passed away. 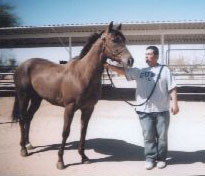 Born in Arizona on March 23, 2004, and was very lightly raced. 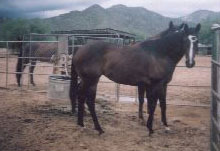 He won his first start at Turf Paradise on February 2, 2007, and was leading the field in his second race on March 17, 2007, when he bowed a tendon.​ He has passed away. She bowed both tendons at the track but went on to become a champion jumper but now she is retired. Her favorite thing to do was to eat! Unfortunately she became very ill and we had to say good bye to her. 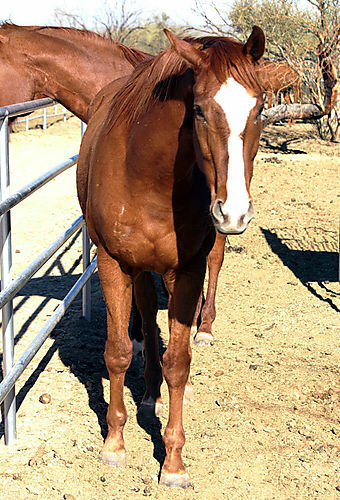 He arrived 12-6-11​ and is a very pretty chestnut gelding who was foaled May 12, 2005, in CA. He only had 16 starts but earned $106,348. He has been adopted December 2012. 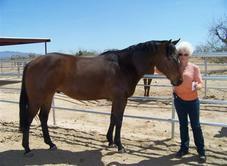 He arrived 3-16-12​ and was a champion Quarter Horse who came to live with us on March 16, 2012. 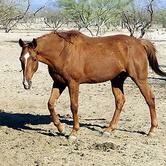 He was a champion 550 yard horse and held the WORLD RECORD for this distance for many years. 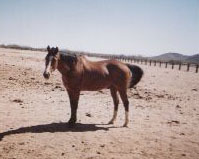 Unfortunately, due to old age and some health issues, we had to say good bye to him at the age of 23. Champ, you will be dearly missed! He came to us August 15, 2005, with a badly shattered seismoid. It was a life-threatening injury, but he showed the same toughness he had shown on the track and survived. Sadly, he has passed away. 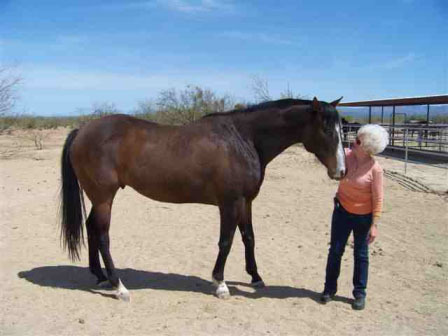 She was one of the oldest horses at the facility, but you wouldn’t have known it by looking at this elegant bay mare who started 93 times and retired sound. A natural winner. Sadly, she has passed away. He did love to fly on the racetrack! Started 99 times ran for 8 years and retired sound. 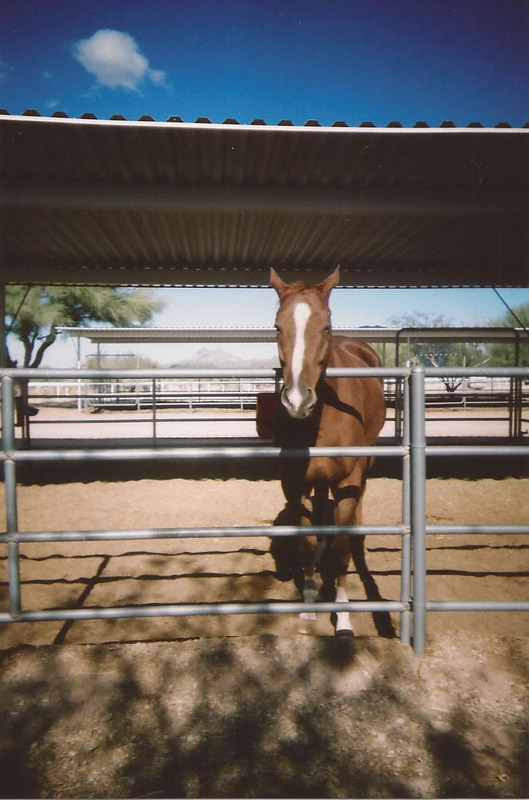 He started his career in Hollywood Park, but after 5 races in CA, he moved to AZ.​ Unfortunately, he had to say goodbye too soon. 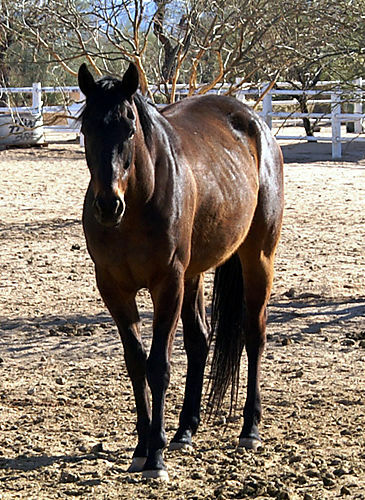 He was a successful racehorse in California who injured a back leg. 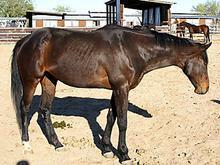 He was given a year off, but he always remembered being hurt and didn't want to be a racehorse any more. 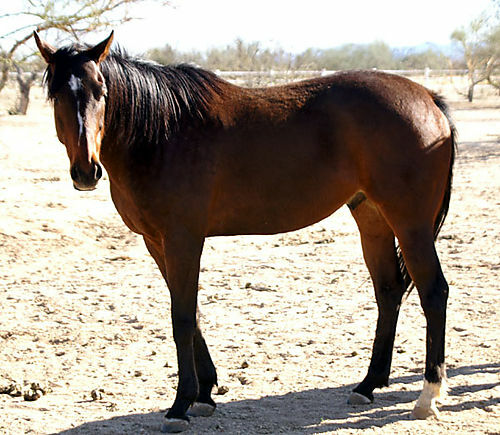 He has been adopted and is in training as a hunter/jumper. 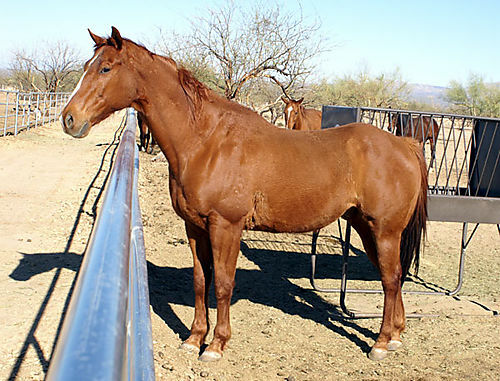 He arrived 6-1-12​ and was an extremely tall and leggy chestnut gelding who was born and raised in Arizona. He started 34 times in his career and accumulated impressive earnings of $239,086 with all of his money being earned in Arizona. Even though he was supposed to move to his new home Christmas of 2013, he became ill and went over the rainbow bridge on 1/2/2014. 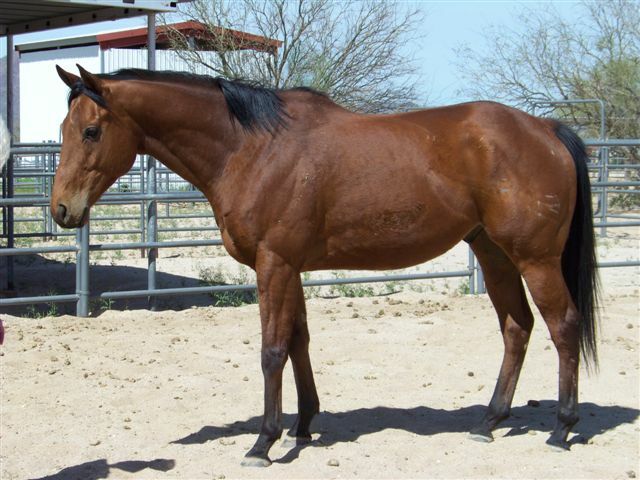 He is a well-traveled bay gelding who was born in New York on April 15, 2004, but started his career in sunny California at gorgeous Santa Anita Race Track. He now went back and lives in a wonderful home in California. 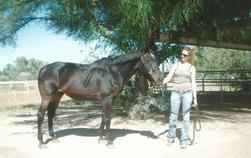 He raced his entire career in sunny California and is the son of California's top sire, Unusual Heat. A bowed tendon ended his career. He loved attention but unfortunately he was taken from us suddenly and unexpected! Brushburn, you will be dearly missed! 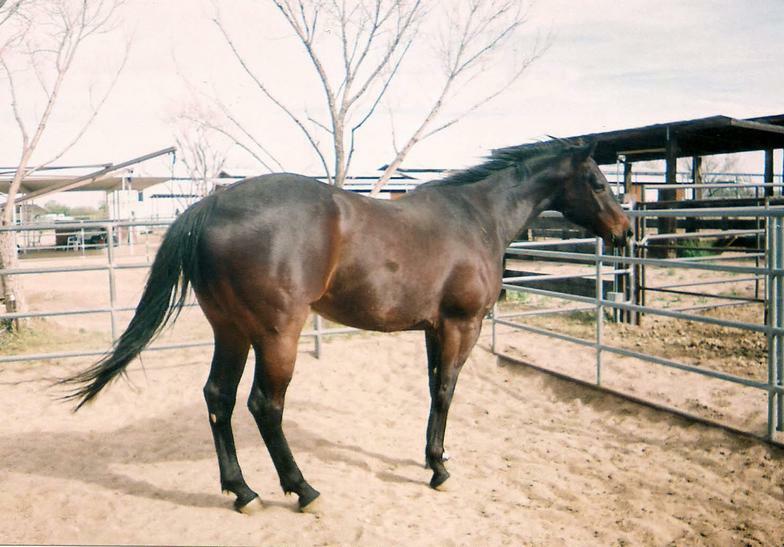 This well-bred daughter of In Excess never raced. 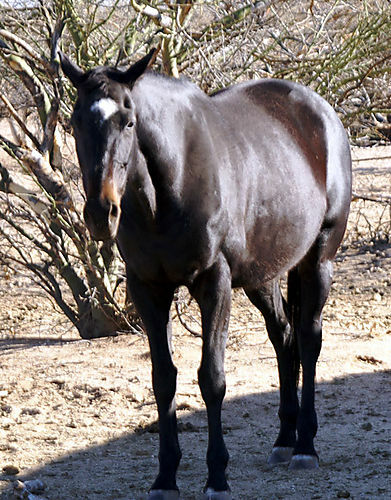 She had some success as a broodmare and now at age 16 was a permanent resident. Unfortunately, we had to let her go right before Christmas 2014. 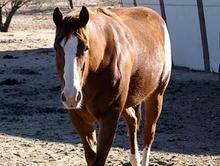 Her leg injuries were getting worse and the pain was unbearable for her. 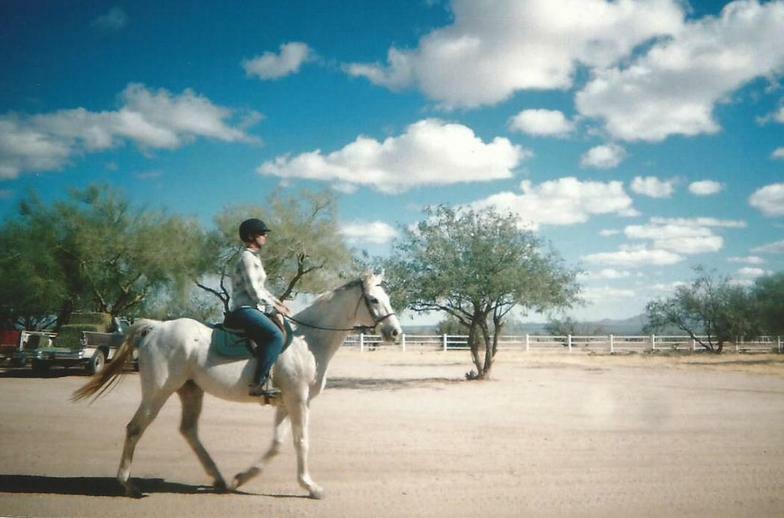 He was another of the smaller horses with a huge heart. 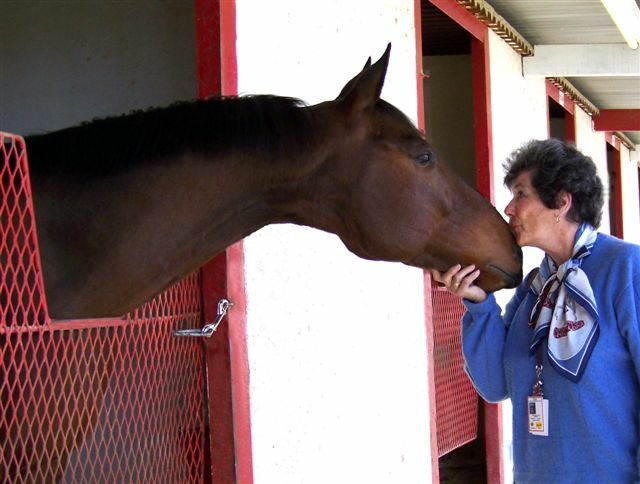 He was very fortunate to have a trainer with a good eye and an equally big heart. 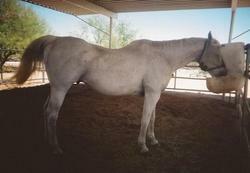 Although Steady Demand did really well at the farm, he became another victim of Colic and left us way to soon. 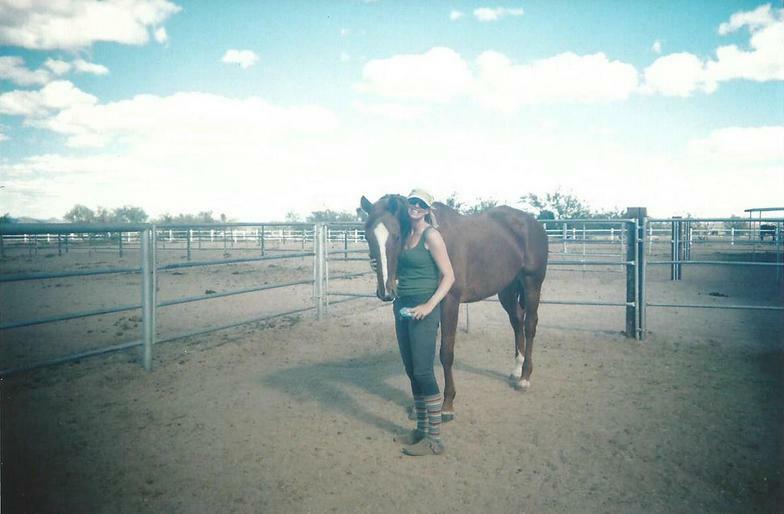 He was another of the smaller horses with a huge heart. 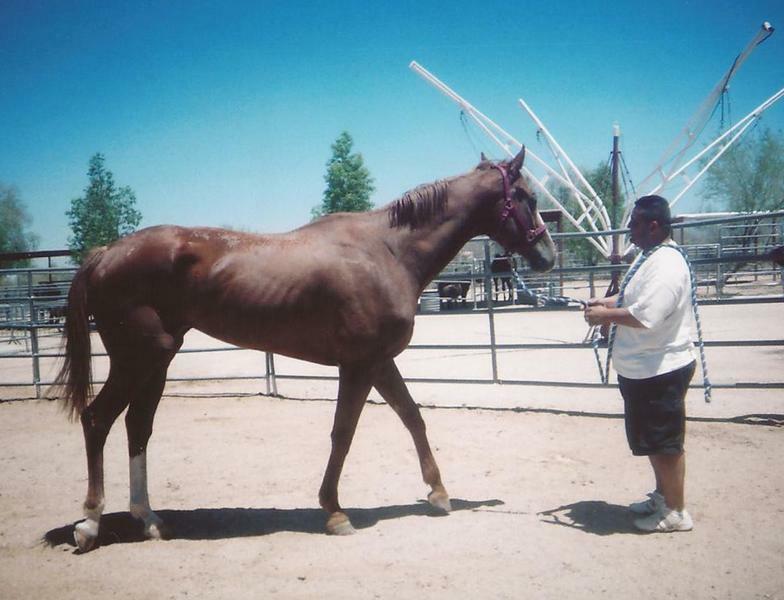 He was very fortunate to have a trainer with a good eye and an equally big heart. 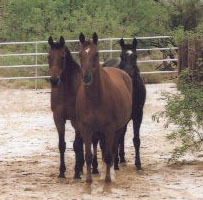 He was a big bay gelding whose career was cut short due to a chip in an ankle and a surgery that went wrong. He only had 9 starts in NM, the state of his birth. He won the first two races of his career and ran third 4 times. He had big shoes to fill and couldn’t quite do it. 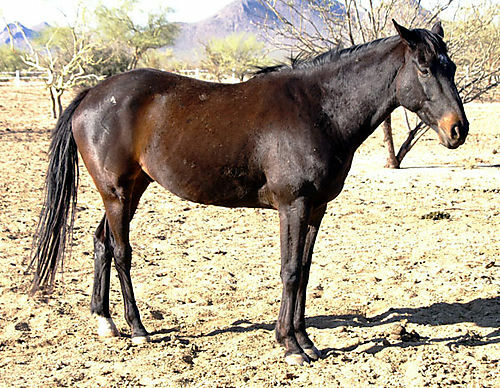 His sire, Festin, was a millionaire, having run second in the Santa Anita Derby and competing in the Breeder’s Cup Classic. Thunderfest had a hard time eating due to problems with his teeth. Even though he still had the spirit to the end we had to make a decision and it was best for him to go over the rainbow bridge. Thunderfest, you will be dearly missed! This handsome multiple stakes winning bay son of Old Topper joined us on August 14, 2015 and left us way too soon 1 year later due to complication. In his seven year career, he started 42 times, winning 12 races, running second 7 times and finishing third 6 times. He amassed earnings of $330,020. He started his career at Canterbury Park in Minnesota and ran his last race at Prairie Meadows in Iowa. He was well-traveled having also run at Arapahoe Park in Colorado, Fairplex Park in California, Turf Paradise in Arizona, Gulfstream Park in Florida, Remington Park in Oklahoma, and Sunland Park in New Mexico. He exudes confidence and dignity and was a welcome addition to our facility and he will be dearly missed! RIP Tie Rod, enjoy running wild over the rainbow bridge! He was a real champion with 13 blacktype finishes! 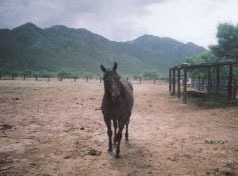 He was born in New Mexico on March 1, 1997, and didn’t leave his home state until he retired with us in April of 2006. ​Unfortunately, in 2014 he was diagnosed with a neurological disorder and he was on medication ever since then. We made his life as comfortable as possible but in September 2016 we hd to say good bye to him. Now he can run wild and free again across the rainbow bridge. He was one of our biggest money earners, having winnings of $792,619. 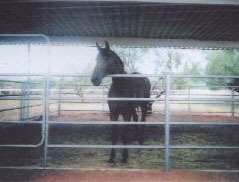 Fittingly enough, he lived with Gulchrunssweet who was our biggest money earner with winnings of over $840,000. ​Wind Water cut his knee around the holidays but was healing up nicely. Unfortunately the angels decided to take him unexpectedly over the rainbow bridge in January 2017. We were all in shock because we never saw that coming. He was so full of life. Wind Water, we miss you buddy! He was one of our oldest citizens. 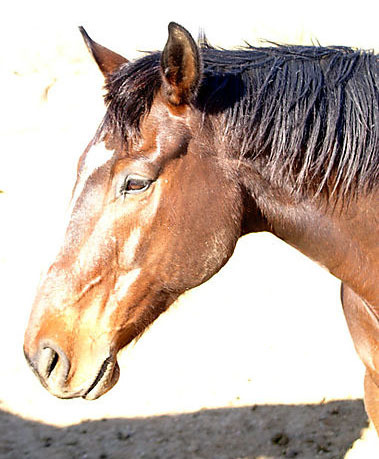 He was foaled in California on April 28, 1988, making him 26 years old when he arrived at the farm on October 3, 2014. He had a short racing career having only 9 starts, all of them in his home state. 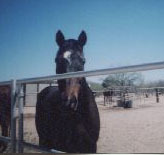 He last saw action at Bay Meadows on January 22, 1992, when he ran third. We were hoping he would make it to his 30th birthday but unfortunately it wasn't meant to be. We lost him in May 2017. We miss you old man!